My winery was too small in any one particular market to attract a solid distribution partner. I couldn’t get the attention I needed (market visits, quota, incentives, call backs) to be successful. I was paying too much money to try and make a market successful; more than sales would equate. In the era of consolidation, the distributor would be acquired, forced out of business or not pay bills on time (or at all). Then I would have to start over. If you’re a Maker thinking about your distribution strategy, it is important to consider the “other” costs associated with traditional wholesale channel sales. There are A LOT and you need to know what you are getting into. All of these costs I consider “hidden,” because they lie on top of the normal–the markup to the buyer (40%, on top of laid in for small production products) and the price of a sales strategy (feet on the street, social media, travel, etc). I decided to put pen to paper and really think about all these hidden expenses (see below list) based on my experience. I’d also like to point out that this list of costs and add-ons is what led me to create the LibDib model. 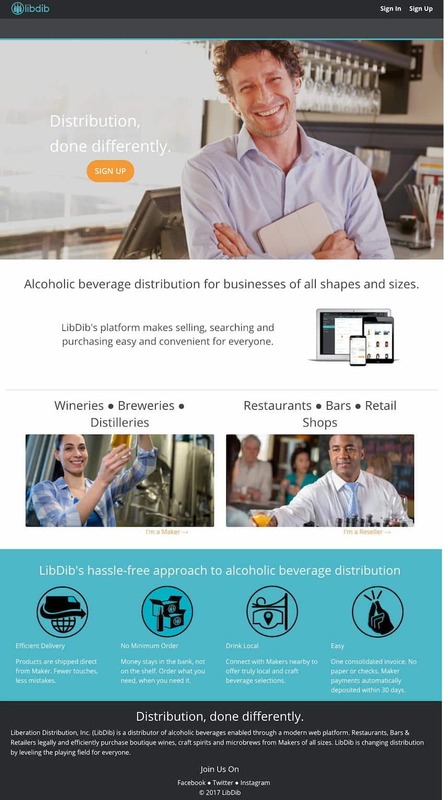 LibDib allows for any brand, no matter what the size, to have distribution in our licensed marketplaces. If you want to sell 10 cases, you can sell 10 cases. If you want to grow to 100 cases of 1000 cases, you can do that as well (stay tuned from some cool stuff coming up in regards to growing brands big). You have control over your distribution, relationships and what products you want to sell. -Attending tastings and submitting for awards. – Researching and networking to find appropriate distributor and contacts. – Emailing or Calling potential distributors. – Sending samples for consideration (cost of products and shipping). – Waiting for tastings and following up (sometimes incessantly) if you don’t hear back. – If the distributor is interested in brand, v they might ask you to visit in-person to pitch the team. It might be a necessary step if you want to close the deal (except with a distributor like LibDib). – The initial order will most likely include a 100% samples allocation of some amount of cases per pallet. – Visiting distributors and attending launch sales meetings (travel, hotel, food). – Working with a rep or two for several days (plan on taking them to lunch at an account). – Launching incentives for the reps (accounts or cases sold $$). – QD’s (quantity discounts) and/or DA’s (depletion allowance) for the accounts to launch the brand. – Ensuring account relationships are maintained (so brand doesn’t get replaced with the “next new brand”). – Spending time following up, visiting accounts (if in market) and supporting with a social media/website presence. – Pushing the key account or chain teams to pitch your brand for consideration to their buyers. This could include a possible market visit just to meet with that “big buyer” if an appointment is scheduled. If placement is achieved, most likely an initial incentive for the reps will need to be put in place for roll out as well as a “scan back” or incentive for the account. – Attending annual or semi-annual trade tastings; some larger distributors have multiple regional tastings around the holiday buying season and suppliers are expected to support with samples and attendance (includes travel costs, time and table fees). – FSA (Floor Stock Adjustments): if inventory is not selling or vintages are getting backed up, you will need to change the price and the distributor will bill you back. – Samples: 50% billback, but big distributors are really watching their margins and not always offering that for new brands; reps have very tight sample budgets and will often try to get around this by asking brand to send them a bottle directly or send to the account. – Printed sales materials for reps, shelf talkers, table tents. – The cost to buy back inventory (includes laid-in costs, plus need to arrange for shipment back to facility or to new distributor). – “Attracting and Signing Up a New Distributor; “return to go” and starting over. – Discounting old vintages to new distributor (or to direct customers if bringing inventory back home) to get the new vintage/batch order in. – Referring to Brand Launch and Continuing Market Work; “return to go” and start over.